Human rights activists say a 22-year-old woman whose execution was delayed while she was pregnant could be hanged within days in Iran. 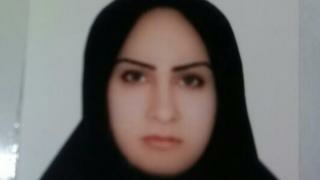 Zeinab Sekaanvand was convicted of killing her husband, whom she says beat her for months. Her execution was postponed after she remarried in prison and conceived a child. Last month she gave birth to a stillborn baby, putting her at risk of death by hanging as soon as 13 October. Amnesty International says Ms Sekaanvand comes from a poor, conservative Iranian-Kurdish family, and ran away from home aged 15 to marry her first husband, Hossein Sarmadi. She said she saw marrying him as her only chance for a better life. But not long after their wedding, she said, he started beating her regularly and verbally abusing her. Ms Sekaanvand was 17 years old when her husband died. She was arrested, and allegedly confessed to stabbing him to death. She said she was held at the police station for the next 20 days and repeatedly tortured by police officers. Iranian judges can spare under-18s the death penalty if they do not understand the nature of their offence. This was not investigated in Ms Sekaanvand’s case, although an official examination found she was suffering from a “depressive disorder” characterised by insomnia and difficulty making decisions. In 2015, Ms Sekaanvand married a fellow prisoner at Oroumieh Central Prison in northern Iran, and became pregnant. Her execution was delayed until after the birth, as it is illegal to execute a pregnant woman in Iran. Human Rights Watch says that as a party to the Convention on the Rights of the Child, Iran is obliged to outlaw death sentences for minors. According to Amnesty, Iran has executed at least one person convicted for an offence when they were a child in 2016, and has at least 49 more child offenders on death row.